Knotted Cotton: Fresh Sewing Day - A month of Liberty! Fresh Sewing Day - A month of Liberty! Not just because the children went back to school. There's been a lot of Liberty fabric in my sewing this month. First I finished this mini quilt which I started at the Stitch Gathering as part of a course on Crazy Patchwork. Then I did something quite new to me which is bag-making. Just before the summer holidays Ali of Very Berry Fabrics very kindly sent me one of her Liberty maxi scrap bags so I could have a play with it. So, first I made a Liberty and linen komebukuro bag. I'll post details of how I made it because it was quite satisfying! Satisfying enough to try a second komebukuro bag. Then since I was on a bit of a roll (for me) I supplemented some of the remaining pieces with a few more bits from a scrap pack I had already, and made these - two Liberty pouches. The squares are about an inch across. Finally I used some of the remaining scraps to make a panel for a music bag. This is a detail. On the offchance you are not already familiar with Ali's shop you should check it out as it is full of beautiful and irresistable fabric - she also has a lovely blog, and is a really nice person to deal with. My one non-Liberty make used Oakshott cottons, and is this entry for the Holiday Memories Mini Quilt competition at Celtic Thistle Stitches. (Not too late to enter!) It is inspired by collecting pebbles with my nephew on holiday with family, and so represents three of my favourite things. 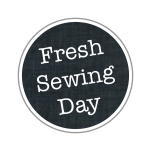 Linking up with Fresh Sewing Day. That bird is adorable and so beautiful. And the pebble mini quilt is just up my street, too! wow - you certainly made that Liberty go a long way! I am v impressed! Wow! Great projects! I love them all! What amazing makes!! I adore the liberty bags and appliqué, but that holiday mini is stunning!!!! The bags look great and the pebble mini is gorgeous! I love collecting pebbles too! Lots of Liberty loveliness Catherine, and a great mini too! What a beautiful month Catherine - I love all your Liberty loveliness! It's a good job I'm useless on the end of a machine, or these makes would have had me heavily bag inspired. Lovely! Such a busy gal you've been this month!! Love, love, love the craziness of the liberty prints on your bag. But...my fav is your musical bag.....that li'l birdy is just too sweet!! love the bags and love the way a little Liberty goes a long way! I love liberty and your bags are just fabulous. The pebble quilt is amazing too! So many pretty projects. Love your bags with scraps. Fab!